What do you do when the one thing you’ve always counted on is suddenly yanked out from under you? This is the question posed in Sharr White’s new political drama The True, presented by The New Group at The Pershing Square Signature Center. Albany 1977. Dyed-in-the-wool Democrat Polly Noonan (Edie Falco) is one of those tireless party workers who lives and breathes politics. A staunch defender of long-time Albany Mayor Erastus Corning II (Michael McKean), Polly has worked by his side for close to 40 years. Indeed, in many ways, Polly is closer to Erastus then she is to her own husband. Though Polly uses the term “confidant” when describing her and Erastus’ relationship, their long-time association has long since caused tongues to wag. Polly often thought of as “the Mayor’s girlfriend,” as well as other, less polite terms. Despite Polly and Erastus’ continual denials of anything improper, the issue has put a strain on Polly’s marriage to Peter (Peter Scolari), someone who Erastus considers to be his best friend; as well as on the Mayor’s relationship with his wife Betty. 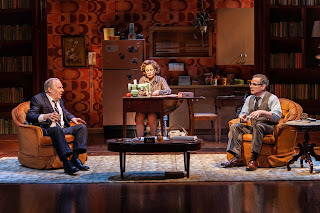 On this particular night Polly, Erastus and Peter are gathered at the Noonan home while reflecting on the recent death of Dan O'Connell, the 91-year old Democratic party chairman who Erastus regarded as an important father figure. Eventually Erastus makes an announcement which dramatically changes his relationships to the Noonans, and leaves Polly stunned and confused. Yet even as word of the Mayor’s actions sends more rumors flying, Polly must decide whether to help Erastus when he needs it most. Erastus finding himself in the fight of his political life as he faces both a battle for the party chairmanship and a serious primary challenge in the upcoming election. 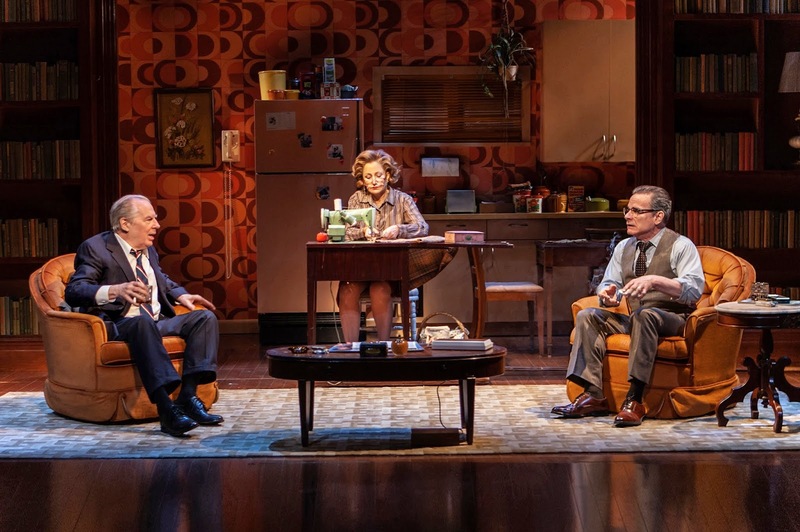 L-R: Michael McKean, Edie Falco, Peter Scolari in The New Group Production of The True. Photo Credit: Monique Carboni. The True offers a nuts-and-bolt look at party politics, through the work Polly does to ensure her team’s machine runs smoothly. She knowing every major political player, as well as all the important constituents, donors, and their families. This knowledge, which stems from endless hours of phone calls, and meet and greets, allows her to make sure those in need are properly helped out, regardless of their political persuasion. Polly reasoning that being good to those who don’t always agree with you just might help change their minds, come election time. Though coupled with this pseudo-altruistic scenario is the realization that politics, especially when it comes to party infighting, turns on backroom deals, clandestine meetings, and loyalty that all too often only goes so far. Also explored is the danger people face when they get too comfortable or rigid in their thinking. Thus making them incapable of adapting to a changing world. Polly and Erastus both looking a bit like relics from a bygone era whose time may be drawing to a close. 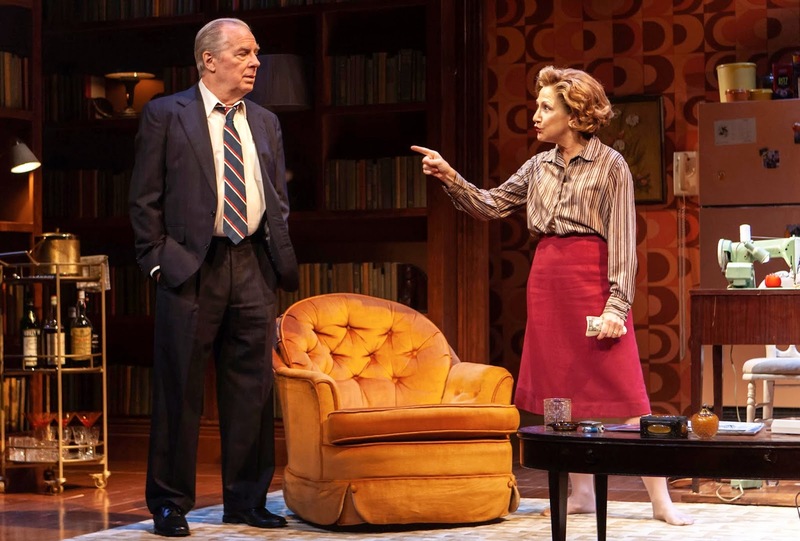 Polly gets a particularly abrupt wakeup call when she meets Bill McCormick (Austin Cauldwell), a young man who she convinced the Mayor to appoint to an important position in the party. However, she explodes in rage when, after outlining Bill’s career track for him, he responds by saying he doesn’t want to be a politician for the rest of his life. Or at least not in the manner she’s laid out. While offering a fascinating look at politics, as well as the sexism that exists therein, as a piece of entertainment, The True falls rather flat. Clocking in at an hour forty-five, parts of the work still end up feeling bloated. A good example of this is how long it takes for Erastus to explain exactly why he changed his relationship with Polly and her husband. Said answer being parceled out in endless dribs and drabs. Additionally, none of the characters presented are particularly likeable and, other than Falco’s powerful portrayal of Polly, none are strong enough to hold one’s interest. McKean’s character in particular comes off as tired and indecisive, with no shading or subtlety that would better define him. Scolari, it should be noted, does nicely portray Polly's husband as a long-suffering spouse. Peter never wanting to force his wife to make a choice which he knows he will lose. However, we never get enough information to really care about this person, or his eventual fate. As for the other characters in the show, they all exist solely as plot points, rather than anything resembling flesh and blood. L-R: Michael McKean & Edie Falco in The New Group Production of The True. Photo Credit: Monique Carboni. On the plus side, Falco grabs and holds the spotlight as Polly. A take-no-prisoner type in both conversation and action, and who, when she finds her back against the wall, fights to reaffirm her self-worth the only way she knows how. Unfortunately, Falco’s efforts are also hamstrung by the lackluster script, which covers no new ground and ends not with a bang, but rather a whimper. Scott Elliott’s direction is rather uneven here and is unable to make the story, or the characters, anything more than mildly diverting. Feeling more like a novel one would read on a commute to kill time rather than a piece of theatre, The True makes some interesting points; but other than a sterling performance by Falco, doesn't have that much to recommend it. Featuring: Austin Cauldwell (Bill McCormick), Edie Falco (Dorothea “Polly” Noonan), Glenn Fitzgerald (Howard C. Nolan), Michael McKean (Erastus Corning II), John Pankow (Charlie Ryan), Peter Scolari (Peter Noonan), Tracy Shayne (Voice).